Several years ago, an investor called me to buy a rental property after losing a great deal of money in the stock market. He was excited to begin his real estate investing career, but was terrified of investing in something new. In fact, at his first closing, his hands shook so much that he could hardly sign his name on the documents. Today, he owns eight houses and has become quite successful. We laugh whenever we recall how nervous he was in the beginning. But real estate investing doesn’t have to be difficult or scary. When I teach people how to invest in real estate, my philosophy is to maximize return while minimizing the risks. When done correctly, real estate investing is one of the safest and best long-term wealth-building tools in the world. 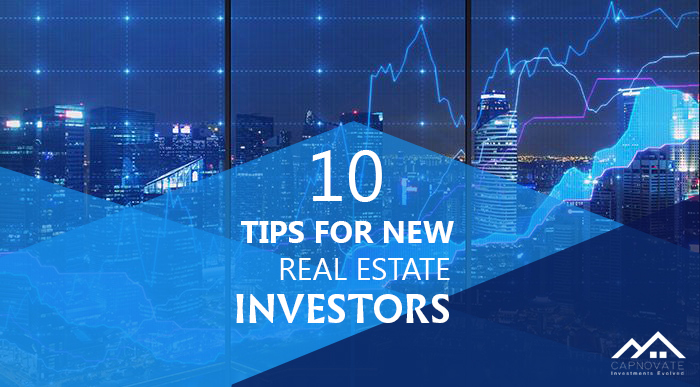 With that in mind, here are 10 tips to help you successfully launch your real estate investing career. 1. Real estate investing is a business, and you should treat it as such. Start by developing a good business plan, detailing the nuances of starting and running your business, with realistic goals over time frames of one, three, five and 10 years. 2. Check your credit report to determine your ability to finance investment property. Most lenders today require 700 or better FICO (Fair Issac Co.) scores from borrowers who want to buy investment property. Also, make sure that your total debt-to-monthly-income ratio is low. Often it makes sense to pay down outstanding credit card debt or car loans in order to improve your debt ratios. You’re entitled to one free credit report per year from the three major credit bureaus (Trans Union, Equifax, and Experian), but they’ll only provide your history, and not your score. Instead, try Credit Karma to get both. 3. Find a good bank or mortgage broker in your area if you’re financing your investments. Realtors (real estate agents who belong to the National Association of Realtors and must adhere to a code of ethics) are good sources for recommendations, or you can ask other investors whom they’ve used. You might want to do this even before you start your property search. If you’re paying cash, you’ll need to prove you have the funds by submitting a recent bank or brokerage statement when you make an offer. 4. Determine the best areas to look for properties. Some new investors make the mistake of limiting their search to areas close to their home. But often better rental areas may be located a little further away. New investors may think they need to live near their properties in case tenants call about repairs or other problems. But in reality, if the home is put into good repair before your tenants move in, those calls from tenants should be few and far between. 5. Talk with other investors about local real estate. Join a real estate club in your area (do a quick Google search to find them). Real estate clubs are great places to network with other investors, lenders, and repair service providers. You can often pick up helpful advice about your local market from other club members. Some communities offer courses on real estate investing through adult education or local real estate brokerages. If you can’t find a real estate club or course, consider an online investing forum. Yahoo Groups lists dozens of real estate groups. The Real Estate Investors Forum of Tampa Bay, for example, has been around since 2002 and has more than 1,100 members. 6. Consider multiple sources for buying properties. New investors may think they can only purchase homes through their local Multiple Listing Service (MLS), or by banging on doors in run-down neighborhoods looking for distressed sellers. But sometimes you can find much better deals on real estate auction sites, such as Auction.com, and these sites make it possible for buyers to easily make purchases in locations beyond their immediate area. 7. Spend time reading about real estate investing. A tremendous amount of free information exists today online about real estate investing. When purchasing a book, look for those that offer practical guides on buying, flipping, renting, and selling properties. Avoid books that claim you can make huge sums of money in 30 to 60 days or 25-year-old books detailing techniques that may no longer work. 8. Find a good Realtor to help you locate properties. Not all Realtors are experienced or even adept at helping investors. Before the real estate crash in 2007 and the subsequent onslaught of foreclosures, only a small percentage of Realtors would even work with investors. Since then, many Realtors have taken courses and suddenly claim to be “experts” on foreclosures. Make sure that you choose a Realtor who has sold a large number of investment properties, and also understands concepts such as return on investment (ROI), net operating income (NOI), and debt service. 9. Look for a return greater than 1 percent per month of sales price. An old maxim of real estate says that a rental property yielding 1 percent of the sales price per month is a good deal. In other words, if the home cost $100,000, you should get $1,000 per month in rent, or about 12 percent annual yield. But in many areas of the United States today, home values have declined substantially and investors can now achieve greater than 1 percent per month returns. Let me share two examples of homes that I purchased with cash in 2013. The sales price of the first was $62,000. It rents for $1,050 per month, an annual yield of more than 20.3 percent. I bought the second one for $39,900, and it rents for $795 per month, an annual yield of 23.9 percent! Even factoring in repairs and other initial expenses, the yields are still 15 percent and 18 percent, respectively, on the two homes. 10. Learn from the best. To achieve success, model your investing decisions after what other successful real estate investors in your area have done. Search Google for real estate clubs in your city, or try Meetup.com. Above all, remember that like anything else, the harder you work and the more effort you put into your real estate investment business, the greater your ultimate reward will become over time. Good luck!